Meet the newest members of the Shifley household, Hot Cocoa and Snowball. Hot Cocoa might be getting a name change to Ninja Turtle but Hayden is still undecided so I'm sticking with Hot Cocoa until I hear differently. 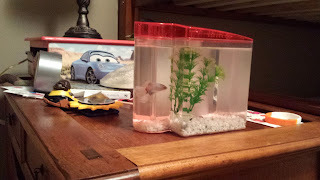 The kiddos have been asking for a fish for a long time and they finally did everything we asked of them to earn it so there you have it. I hope we picked two of the toughest Bettas they had in the store because these guys might get neglected but so far the kids have been doing a good job with them. I wouldn't recommend leaving a bag of ice in the back of your car for 3-4 hours while it's parked in your driveway in July and it's 90 degrees. 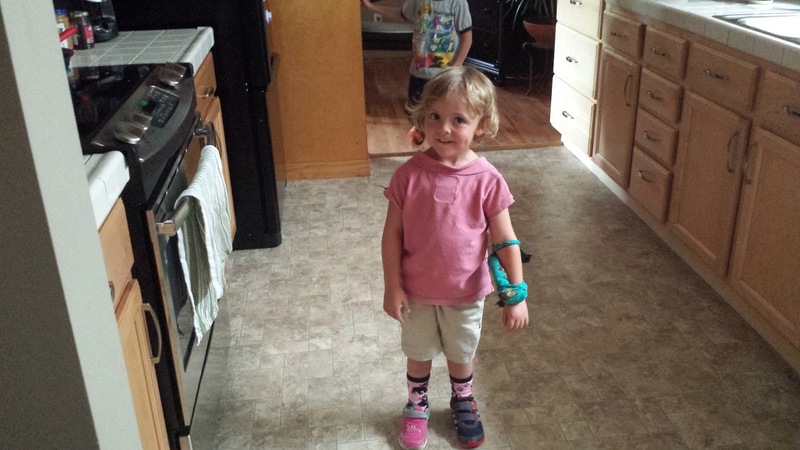 Hayden is cast free and so excited because she can know wear a shoe on each foot. And jump. And play soccer. And ride her bike. And run. We went to the store with her dressed in this outfit. It took a lot for me not to have her change because I'm neat and tidy. Even though her shirt and shorts are on backwards, even though her socks of choice were more appropriate for winter, even though her feet are adorned with two different shoes, I did nothing. She was so proud of dressing all by herself and she was happy. In our house I think we've killed about a baker's dozen of fish, without a filet to speak of. They're great pets though. Not attention hungry at all. 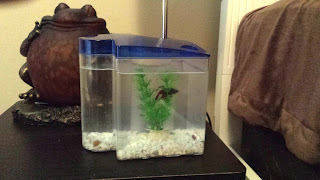 I had a betta once that I swear lived on water and neglect. My grandsons have one now. He is named...Moona. They once had some hamsters or guinea pigs or whatever-those-rodents-are and Owen named them "Daddy" and "Owen". It was sort of sad when they died. 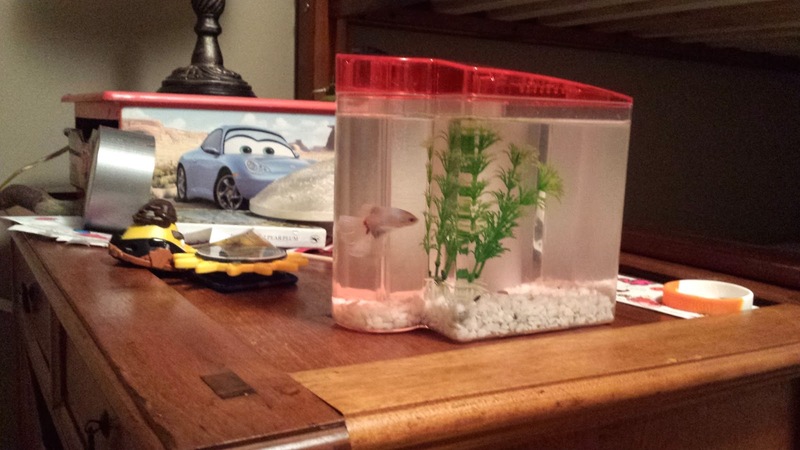 I used to have an aquarium, for fish - not me. Hope the children get as much pleasure out of it as I did. I think I should rephrase that but I guess you'll know what I mean. Hayden looks lovely in her mixed attire - clever girl. Absolutely love the outfit! I have a similar type shot of Faith about that age. How is Tank doing with training? great to see hayden back in the saddle. if your kids are like mine, hayden is probably a little tougher than kyle. every time i watch the x-files and see mulder's aquarium i think about getting another one. I'll bet Hayden starts a fashion trend someday!!! Jeez! Star Scream has grown so big! Pour that lady a piping hot ice cream soup from the back of the car, but have her use a straw as to not spill any on her backwards shorts.